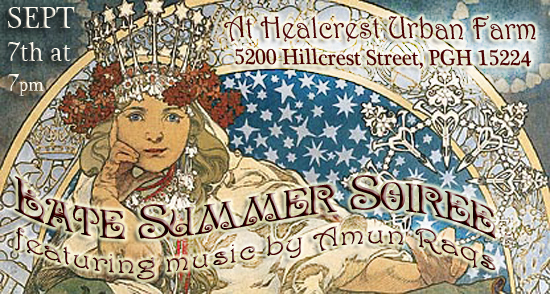 Come celebrate late summer and new beginnings with the amazing sounds of Amun Raqs, Street Foods, Healcrest TeaPops, open dance, and surprises! Join us 7pm At Healcrest Urban Farm 5200 Hillcrest St. Garfield, PA. RSVP here at http://www.healcresturbanfarm.com/events.html or contact healcresturbanfarm@gmail.com. We ‘re pleased and grateful to be featured on The Allegheny Front! Thanks to Hal B Klein and Kara Holsopple for visiting with us. New Class Coming in September! We loved Natalya’s Fermentation class. A great mix of academics and adventure! Pickles, kefir, and sourdough, fermentation was a taste explosion for the food daring! Natalya provided simple home kitchen techniques for delicious preservation. We’re looking forward to continuing this food exploration in September, dates TBA. Stay posted! Register for classes here at http://www.healcresturbanfarm.com/classes.html or contact healcresturbanfarm@gmail.com. Composting in the City: How, What, Where, and Why! Where does all your food waste go? Would you rather have it be beneficial waste instead? In this workshop you will be introduced to a few easy methods for turning food scraps into soil, or composting, in dense spaces. Whether you have a huge yard or none at all you will go home with a method or modified method that will work for you. We will explore bin, trench, and vermi-compost. You will also have the opportunity to take part in our Healcrest Compost program, where your waste is our treasure. Dana Launius will share her experience and love of sustainable living in this fun and educational series. Simple techniques for a waste-resource lifestyle. Each participant will leave with some materials to get their compost started or enhanced! Bring water to drink and come prepared to get icky!